…I do not know how to suitably express just how wrong I was. NZXT, Cooler Master, Futuremark, Raijintek, EVGA, MSI, SilverStone, Corsair, Team Group, ARCTIC, In Win, CRYORIG, GIGABYTE, and AMD. There are other brands within the game of course, but those listed above are Official Partners of the game. Development is still ongoing, as the game is currently in Early Access; I would imagine that more partners will continue to join the ranks, as exposure via the game is an excellent form of advertisement. This is not to say that the game itself feels like one big advertisement for certain brands, but that it most definitely adds the authenticity that a game such as PC Building Simulator demands in order captivate the player base. Whilst I am usually not a fan of Early Access titles (once upon a time devs used to pay testers to play their game believe it or not, whereas nowadays players apparently pay to test) and their ramifications, it completely makes sense in this instance. Having witnessed the current state of the game — as well as the future potential it has — hardware manufacturers are now reaching out to the team so their products can feature within the game. As I am no stranger to the simulation genre, I had a rough idea of what to expect from the mechanics of the game. The premise of Career Mode is a relatively straightforward affair: you begin the game with nothing (thanks Uncle Tim) and strive to transform your humble business into a successful enterprise. 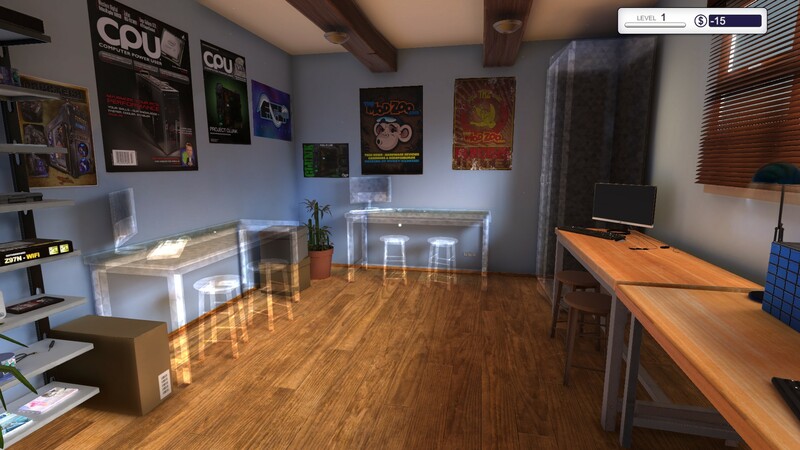 Now usually in a simulation, this core aspect of the game is relatively uninspiring and focuses on the completion of tasks to make money; PC Building Simulator naturally follows that same model, but how it accomplishes that is truly fantastic: it has a story. I do not mean a story in the conventional sense, there is no overarching plot or struggle against evil, but the stories that are presented in the emails you receive from customers are just fabulous. 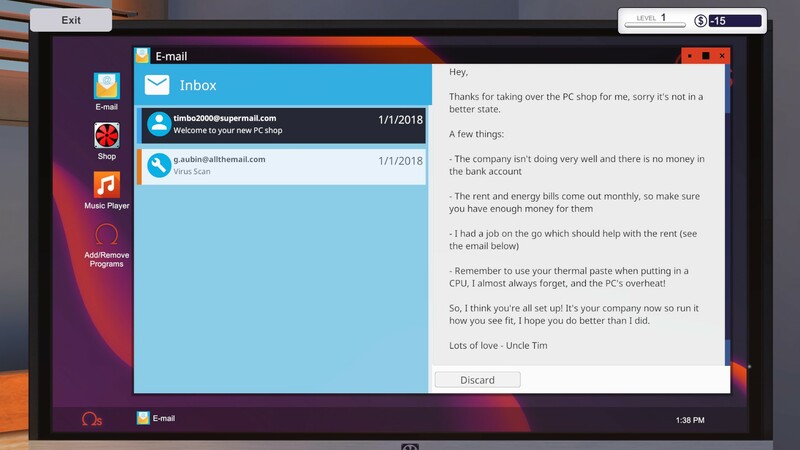 Whilst initially you are bombarded with the stereotypical requests of removing viruses from a PC or ‘I spilled noodles on it and now it doesn’t work’, there are some great examples of repeat customers that you deal with and their developing stories. This aspect of realism is what really makes PC Building Simulator stand out for me. The dream of building custom PCs for a living is one that many people have, the harsh reality however is that most of the time you end up dealing with mundane repairs and dealing with individuals that probably shouldn’t even own a PC in the first place. Trust me, I can attest to this; and the game mirrors that initial reality perfectly, even your own #battlestation (which is effectively your command centre, emails/online shopping/etc) is quite unremarkable at first. After ‘paying your dues’, you start to unlock more interesting jobs such as custom builds or even giving a rig some flair with RGB components. Combined with the leveling system that is in the game — as you progress, you unlock the ability to purchase better components — you certainly feel that you are beginning to succeed. 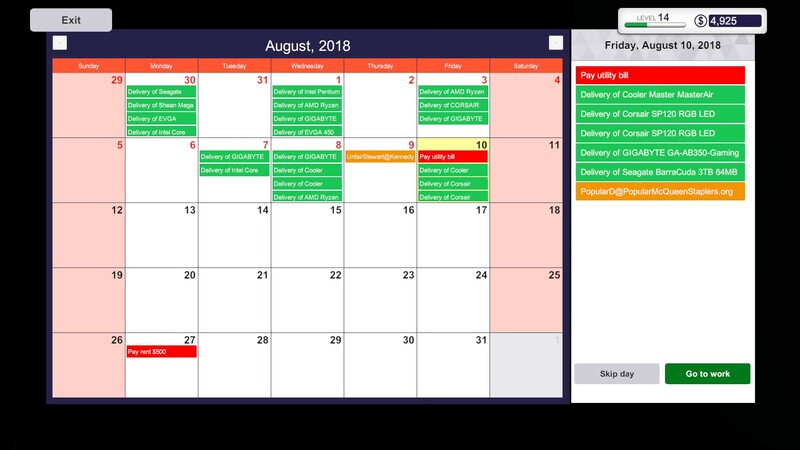 Eventually you will be able to have 3 projects on the go at a time, and be able to complete them in no time thanks to the upgraded tools you can purchase. This is not to say that the game’s systems are perfect though, at least currently; remember it is Early Access after all. Whilst initially you barely make a profit on each job — and you can potentially lose money if you do not plan things properly — there are some minor mistakes within the mechanics that can result in some tidy profits. For example, a customer has a PC that will not boot, after diagnosing you discover that the i7-7700K has given up the goose. A fried CPU, what a shame. Now, a ‘good’ tech would order a brand new i7-7700K for $350 and complete the job properly right? But what if you could just slap in an i3-7100 for $115 and the job would still count as ‘completed’? Yep, you can do that. Whether this is an oversight or a complication due to coding, this could potentially result in the customer contacting you later down the line to complain (which remains to be seen), but currently it is a strange little mistake. That being said, it does allow you to be somewhat of a hustler in the PC repair world if you wish. Do I Need to Know Stuff? For an experienced PC builder that has a working knowledge of benchmarking (anyone else remember when Futuremark was called MadOnion? ), upgrading a PC to hit certain benchmark scores is very intuitive and relatively straightforward. In fact, a challenge for many will be trying to hit those scores whilst spending as little as possible (like setting 2 cheap cards up in SLI/Crossfire rather than spending more on a single card solution); but what if you do not know much about PCs in the first place? Will PC Building Simulator be a complete waste of time? Quite frankly, absolutely not. Whilst veterans of the upgrade scene will have a lot of fun, and find things fairly easy; the game has also been designed with complete novices in mind as well. The ‘learning experience’ is done so well in this game that The Irregular Corporation has been approached to get PC Building Simulator into classrooms. There is of course a tutorial mode to teach you the basics of building a PC — which is perfect for novices of all ages — as well as a Free Build mode, where you can just experiment with components to see how they look and/or perform with each other. The possibilities with this game, especially via mods or future updates/DLC, are potentially limitless. There are applications within the game such as the Part Comparison tool that give you a great idea of how components score in the benchmarks. So if you want PC Building Simulator to be a learning experience, it certainly can be. I have read several testimonials from players stating that they now have the confidence to try to build their own computer after playing this game. This is huge; how many simulators can truly inspire people to try something for real after experiencing it within a game? Even though the game is currently in Early Access, the caliber of the content makes it feel like a full release. Features such as the music player (which of course is installed on your own in-game PC ), which allows you to listen to your own music rather than that of the game, or even Internet radio if you prefer, are a nice ‘quality of life’ convenience. I also really look forward to discovering what new stories appear as I progress through Career Mode, because they have honestly been quite amusing so far. But the true excitement (at least for a techie like me) stems from the features that are coming soon. For a game that had initially barely registered on my radar, it is amazing what a difference almost a year can make. 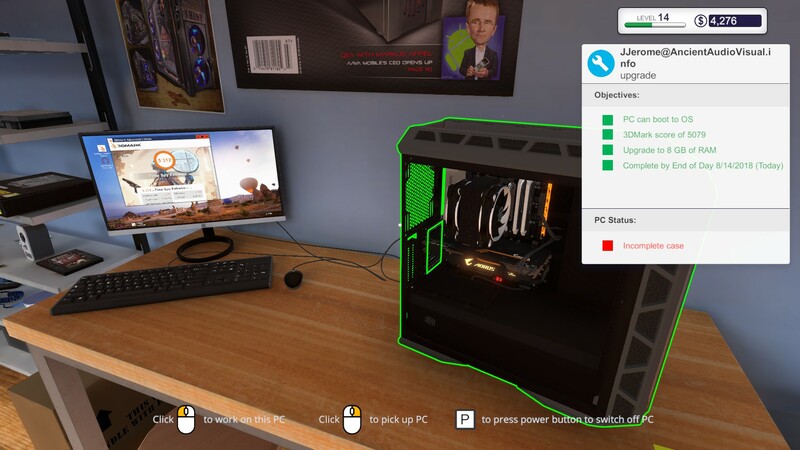 PC Building Simulator is already a fantastic game, and in my opinion is an absolute bargain at its current price. It is also rather exciting to see a game that is clearly being shaped by the feedback from the community, and that is becoming a hot commodity within certain circles of the tech world. 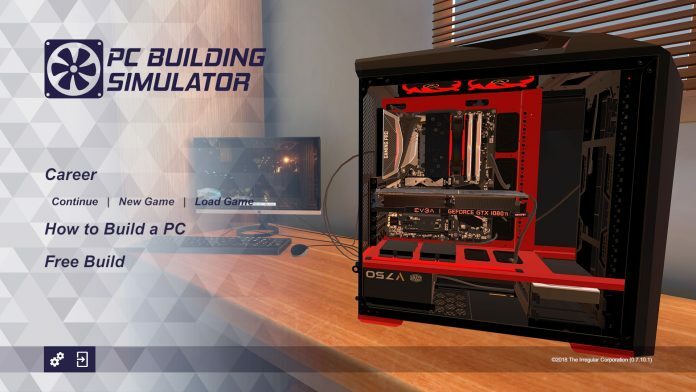 Whether you eat/sleep/live PCs or not, PC Building Simulator provides hours of fun. You may even learn a thing or two along the way.